The fugitive Ecuadorian bankers at the center of an alleged FBI probe of Sen. Robert Menendez (D., N.J.) deny that they traded campaign donations for political support from the senator. Menendez reportedly sent a letter to the Department of Homeland Security in 2012 lobbying against an Ecuadorian government extradition request for the two bankers, brothers William and Roberto Isaias Dassum, who were convicted of embezzlement in Ecuador and are living in Miami. The FBI is allegedly investigating whether political donations by the bankers’ family members were related to Menendez’s lobbying effort, WNBC New York first reported. The Isaias brothers denied the allegations and said they are victims of an "aggressive and systematic campaign of persecution by [Ecuadorian president] Rafael Correa and his totalitarian regime," in a statement to the Washington Free Beacon on Friday. "The corruption, lack of fairness and due process in Ecuador’s judicial system is well documented and extends beyond us to prominent journalists, independent media outlets, and others that have been jailed, harassed, and punished," they said. "We know firsthand how democracy, human rights, freedom of the press, and due process has been trampled in Ecuador. This experience has led members of our family to exercise our democratic right to support elected officials in the U.S. from both parties that defend and promote these principles in the Western Hemisphere. Any donation made by any member of the Isaias family is driven by these values and have been made in a normal and legal manner in accordance with federal election laws," they said. Menendez’s office did not comment to the Free Beacon. He told reporters on Thursday that the charges were "ridiculous." "A year after a false smear campaign was launched against me, once again we see anonymous sources," Menendez said. "I’d like these people to come forward but we’re back to anonymous sources making ridiculous allegations." This would be the second FBI probe into the New Jersey senator, who has also been under scrutiny for his relationship with one of his major donors, Florida eye doctor Salomon Melgen. Menendez allegedly contacted administration officials to defend the eye doctor against Medicare fraud charges in 2012 and later intervened to support one of his business projects. Melgen and his family have contributed nearly $175,000 to Menendez and the New Jersey Democratic Party since 2006, according to reports. The senator also initially failed to disclose and pay for flights he took on Melgen’s private plane. After the flights were made public, Menendez said he reimbursed the eye doctor. But sources say the latest allegations against Menendez do not seem as substantial as the Melgen case, at least based on the details that have been published so far. According to WNBC, the Isaias family contributed $10,000 to Menendez, far less than the Melgen family. "The NBC story seems a bit thin on the scope of the investigation so we are searching for what else may have triggered the federal investigation," said Ken Boehm, chairman of the National Legal and Policy Center, the government watchdog group whose investigation into Menendez last year triggered the first news reports on his questionable relationship with Melgen. The FBI field office in New Jersey said it could not comment on the matter. Boehm said it is likely more substantial details will come out, but added that local or national politics could have also played a role in the probe. "Menendez is not well-liked by the administration," Boehm said. "They would like to see him kicked out as the chairman of the Foreign Relations [Committee] because the number two person, [Sen.] Ben Cardin, is much more to their liking. So is there politics like that involved? Who knows." 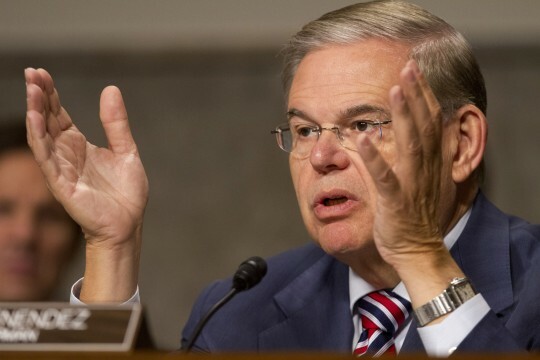 Menendez has recently clashed with the Obama administration over his leadership on new Iran sanctions legislation, which the White House argues will undermine its nuclear negotiations with Tehran. A source who has worked with Menendez’s office on foreign policy issues said the senator has "been under withering assault from the White House for a range of issues," but that the investigation is not likely to interfere with the sanctions effort. "[Menendez] is determined, he is unyielding, he’s going to see this through," he said. This entry was posted in Politics and tagged Bob Menendez, Rafael Correa. Bookmark the permalink.